There are so many great organizing quotes! Here are a few that especially bring a smile to my face. Done is Perfect. Donna Smallin coined this phrase in her book Organizing Plain and Simple. Don’t get caught up in perfection, just get your job done! Well begun is half done. Mary Poppins has many professional organizer traits! In her song, A Spoon Full of Sugar, we all learn that getting started is half the job. And then you are already half way complete! Just do it! Taken directly from Nike, but I couldn’t resist! Drain the swamp, regardless of the alligators. Many obstacles keep us from completing a job. Find a way around the big teeth and get the job done. Keep it simple sweetie! Be sure as you organize and as you live your life, the priorities and path are clear for you. Hugs and happy organizing. My favorite of all! What is your favorite saying to get the job done? What organizing quotes inspire you? 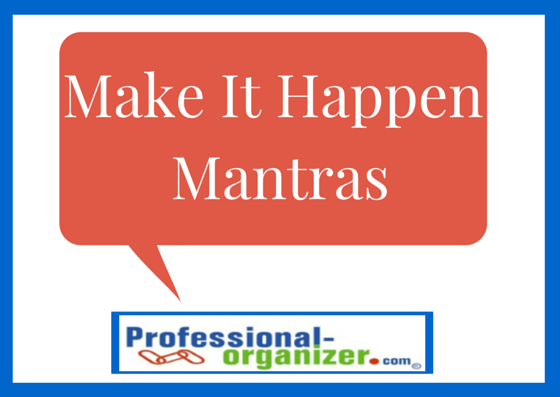 Mantras and more! Join my newsletter for a dose of organizing ideas monthly. Downsizing? Right sizing? Empty Nester? Transition with a new baby? Learn the simple ways to make a difference for your home and create peace of mind for you and your family! Happy Organizing and see you there! School just started and already there are possibly some anxious moments of lost homework, a disheveled backpack and unknown test dates. Whether it’s keeping track of homework or remembering to bring home a backpack, all students need to be organized to succeed in school. 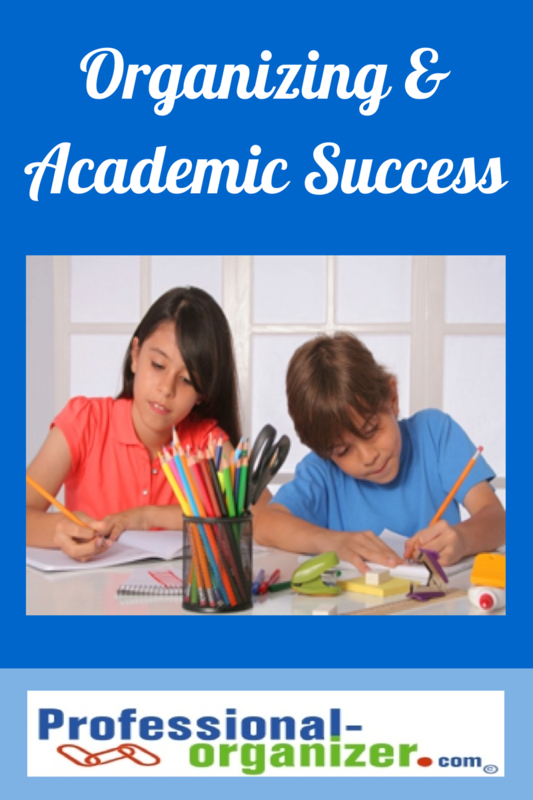 For many students academic challenges are often due to disorganization. Organizing for academic success is a learned skill and the right tools and routines can make a difference for any student. Organizational academic skills are what leads to life skills. A planner is a vital tool for the organization plan. The planner helps your student keep track of long range and daily assignments, tests and homework. A “week at a glance” format is best, and be sure there is a space to record assignments for each class each day and extracurricular activities. The best choice is a planner sold by the school which will include vacation and exam dates. To begin the year, gather all syllabi and record all the dates for major projects and exams. Then go back, working backwards and write in the “baby steps” that lead to preparation for the work. Daily assignments should be written in each day, as soon as assigned, regardless of how small the assignment is. Each afternoon review the planner, adding to it using additional resources found on the teacher’s web page and any additional assignments or test preparation. With consistent use, your student will know when to turn in papers for class in a timely fashion. The planner should be the one calendar the student uses, so be sure to include all other activities from sports to social engagements. Consistently using a planner is a lifelong skill well worth investment in the student’s time and effort. Routines are a critical aspect of organizing for academic success. Creating a structure for homework time is equal in importance as the other aspects of organizing. Check with your student’s teacher to find out the amount of time homework should be taking each night. Set aside that amount of time and designate it as “Homework Time” on a nightly basis. On a given night, if your student has fewer assignments or finishes up early, the remaining time should be spent studying for an upcoming test, working on a long-range project, or reading a library book. If your student knows that 30 – 45 minutes will be spent on school related activities each night, he/she will be less likely to try to rush through assignments, or to skip them altogether. Create a daily routine that has homework at the time of day that is best for your student. A snack and a few minutes of time to unwind before beginning homework is a good break and then your student is ready to begin. For effective and efficient study time, it is best to limit distractions. Low music can help some students concentrate, however other technology such as television or computer should be discouraged. Many studies have shown how ineffective “multi tasking” is for all of us, and students are no different. The final part of this routine is to repack the backpack and place it at a “to go spot”, ready for the next day. By reinforcing consistent and committed use of the planner and the accordion file as well as homework routines, your student is best prepared for school each day. Establishing good organizing systems and routines should begin at the outset of the school year. Talk with your student about the importance of being organized, what benefits your student and your family will experience from being organized, and how to begin and incorporate the process. If your student is not experiencing the success you think is possible, the book The Organized Student by Donna Goldberg and Jennifer Zweibel is an outstanding resource for more ways to organize for academic success. Commitment to the organizing process and your student’s desire to be organized is all it takes to make a difference! The International Association of Electronics Recyclers reports that “Each year we scrap 400 million units of electronics in the US.” Many times we want to recycle to make a difference and just don’t know all the resources. 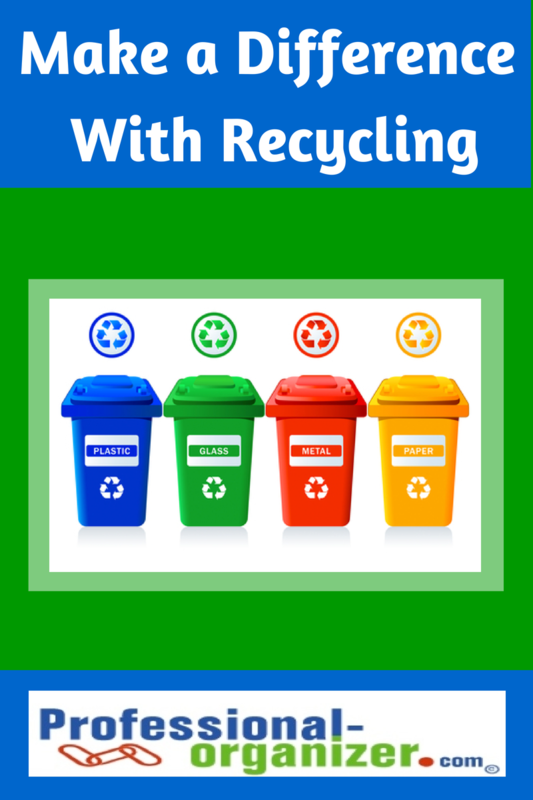 This is a short list of ways to reduce, reuse and recycle. Families are busier than ever. To keep up with your events and to keep your family communicating hold a weekly “family meeting”. Families need time to prioritize, know what is coming up, talk through all the activities, and cultivate your relationships. Choose a day and time each week to hold the family meeting to share important dates, upcoming activities and share family members’ accomplishments. At the meeting, fill in a calendar with each person’s upcoming events and deadlines and then hang the calendar kitchen where everyone can see and review it regularly. After this 30 – 45 minute family meeting, join in the fun with a special meal or dessert, game night or movie. This team building creates a special bond where everyone is heard and everyone shares what is important. At our family meeting, each member shared one anecdote about what “one good thing” was about another family member. Some times siblings needed to “stretch” to find the one good thing, but making each other feel a special part of your family creates affirmation for that person that builds self esteem. What day can you start your family meeting? Organizing your car means having handy access for the things you need, when you need them, without having an accident to get to them. What about maintaining your organized car? If your car is “trashed” regularly, here are some hints to help you easily keep it in order. Empty trash at each stop along the way. As you get gas or run errands at Target, drop your trash in the cans just outside the door there. Or you can place a large trash can in your garage for you to easily drop in items. Take advantage of these trash cans along the way. Up to date registration and safety stickers are easy to renew if you calendar the date on your planner. It saves the cost of a ticket! You can enter this as a recurring event on your Outlook calendar too. Need to keep track of mileage for expenses? Keep a mileage log in your car and write it down during a gas stop. Regular intervals like this weekly stop create a baby step for an often overwhelming task. Empty the extra stuff out of your car each day. It is a small step to keep your car from being a dumping ground by distributing items back into your home where these belong each day. Assign this task to your family team members too to get the job done. Is your car your office? Once a week refill the items you use regularly, like business cards or marketing pieces, into well defined spots in the car. It is like preparing for a quick meeting by having handy these items. What baby steps are you taking to keep your car organized? Hurricane season begins on June 1 and extends until November 1. Being ready has different meanings depending on whether you stay or leave your home. Having been through 2 major hurricanes in 3 years, Houstonians want to be prepared. September is National Preparedness Month too! In a small portable safe, organize these documents: copy of passport, copy of drivers’ license, mortgage info, credit card info, banking, social security cards, will, birth certificate, marriage certificate, military records, 2 previous year’s tax returns, insurance info and divorce documents. Many different websites recommend what to have on hand for remaining in your home. Start with a baby step on preparedness this week! In my life, making and having a great list can make things so much easier. On the Family Manager website, www.familymanager.com, there are many lists for productivity, family chores and peace of mind. Creating a list gets it all off your mind and you can really live and do “in the moment”. But what if there were lists made for you so you don’t have to think about it all yourself or that go beyond your own ideas? Weekly Hit List: Save your sanity with an orderly list of task. Family Manager divides your tasks in the the six major departments of life. Using this list, you can write down all the tasks and priorities for week. Seeing it all written it is easy to review what is to be done, deleted or delegated. Who’s Responsible for What, Age Appropriate Chores List and Kids Chores Chart: Who said Mom is always responsible for all chores? A full list of all the possible jobs for family members. Use this list for family members to choose what they prefer or do best. Assign points for level of difficulty of the chores and then create your own chores chart to post in the kitchen for all to see. House Rules Contract: Family communication begins with agreeing on family guidelines and expectations. Use this contract as a guideline for your family’s discussion. Lists are an easy way to make anything more visual, from the files in your file cabinet to the gifts purchased for holidays. What lists work for you and your family? Procrastination affects even the most linear thinking right brain people (professional organizers!) and there are strategies to help you make simple shifts to change. Sometimes procrastination can take on a life of its own. It brings on worry, depression, regret, and stress and has the power to reduce people’s ability to function normally. The first step in moving forward it recognizing what is most difficult about productivity or the task itself. Is it the spot where you work? Is it the work itself? Is it working by yourself? Here are some ways to get started thinking about procrastinating. Set up a distraction free, reminder rich environment. Think through where you work best with an appropriate chair, desk and space. Do you need soft music, good lighting, or any other options? Is your space in your home or out? Reminders can take the form of post it notes, 3X5 cards, or a task list on your PDA. Establish priorities. You may be busy with low priority tasks, for example pruning the hedges instead of working on your presentation that is due the next day! Prioritizing is the first step to being more effective day to day. Part of prioritizing is making manageable, short lists with a “do-able number” to ensure success. Commit to what is important by slotting tasks on a calendar. This sounds simple but this exercise cements the task in your mind which is important when you struggle with focus and time. Set “mini deadlines” and add rewards to keep you moving toward your goals by delaying gratification until completion. Sometimes it takes more than the space or time to complete a task. Find a partner to discuss the steps and be accountable to completing. Accountability can be done with texting, telephone or a quick email. Loving accountability makes you more successful. 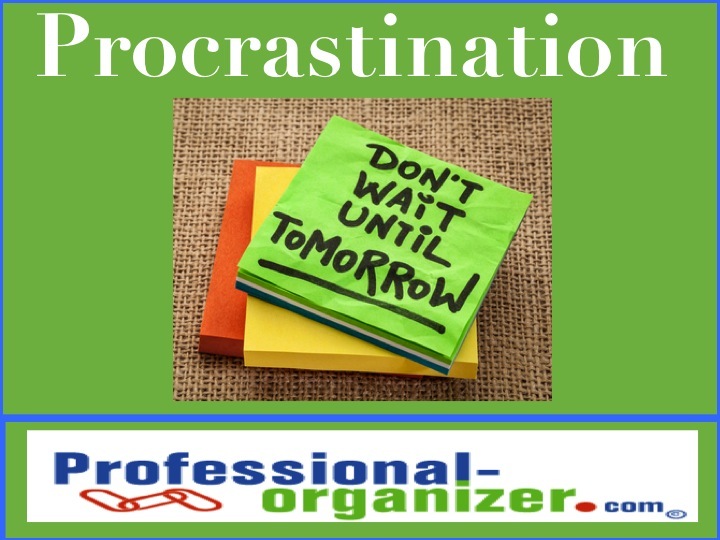 So what do professional organizes procrastinate about? For me it was being the committee chair of a national committee. Once I had calendared the dates for significant events, committed to working on baby steps in the process, and finding partners that helped me in the process, it all proceeded well. Have you uncovered the cause? It is an honor and privilege for me to partner with teachers in setting up their classrooms. Teachers and classrooms are set up to maximize a productive, nurturing environment for learning. In our work together, we create a custom space for the teacher to reinforce concepts and classroom management. Setting up your classsroom begins with room/space arrangement. Start with the global view of what do you want to accomplish in which space. Typically there is a teacher work zone with the desk, files, and bookshelves. The student spaces include personal desks and small group spaces. There is storage for supplies and the daily lessons. Final room touches include the bulletin board and the wall decor. By asking yourself questions and centering on the curriculum, the classroom takes shape. Take each zone individually to maximize productivity for the task and to store items. For the teacher work area, have a space for computer, a small quantity of school supplies, easy access for adminstrative tasks, easy access for the day’s curriculum, and a small space for personal items such as snacks. For the admin tasks, think of the papers you will get daily and need to be filed, returned to the office, or send back to parents. Each should have a “slot” to drop these in and then take a few minutes to act on the appropriate paper. The cascading file tote from The Container Store works well for admin papers. Be sure to label it with your categories of paper, including administrative, parents, or filing. By using the wall space you are keeping paper off your desk too! Curriculum and lessons need a specific spot. You can use vertically stacked letter trays or plastic drawers to hold each day’s lessons. Keep lessons in the space you are using these, in the front of the classroom, at your small group work station, or in the file cabinet for the following week. Again, lots of labels needed! You can categorize by day of the week, curriculum concept (such as sequencing), or curriculum area (such as math). Storage in classrooms follows the same concepts as all organized storage. Keep like things together and items you access frequently easy to reach. Use containers to keep floppy, small items each to store. The most difficult aspect of storage is to keep ONLY what you use. Review your cabinets frequently to get items back to where these belong. Curriculum resources can be found on bookshelves behind the teacher’s desk. Keeping your classroom organized occurs with good routines. Have your students help you maintain the order in the class by returning items to their proper homes. You are teaching more than curriculums of math, science or language. Organizing is a life skill that is very important to share. Since I moved to a new classroom this year, I had to do more than just rearrange and re-organize. I had to rebuild. Ellen helped me to begin by thinking globally. What do I want the big picture to look like? What will I need to accomplish today to feel as though I have been productive? She also helped me to narrow down and focus on one task at a time while prioritizing which one needed to come first, second, and so on. Just another set of hands makes a great difference, but sometimes having someone to guide you (and sometimes push you to get the work done) is what leaves you with the feeling of complete success. From arranging student desks to connecting extension wires, from desk drawers to cabinet shelves, and from storing unused materials to decorating walls, my feelings of overwhelmed and impossible changed to prepared and confident with a little help from a fantastic organizer. Thanks professional-organizer.com! Ellen, you’re the best!